DA Form 2397-u - also known as the "Unmanned Aircraft System Accident Report (uasar)" - is a United States Military form issued by the Department of the Army. 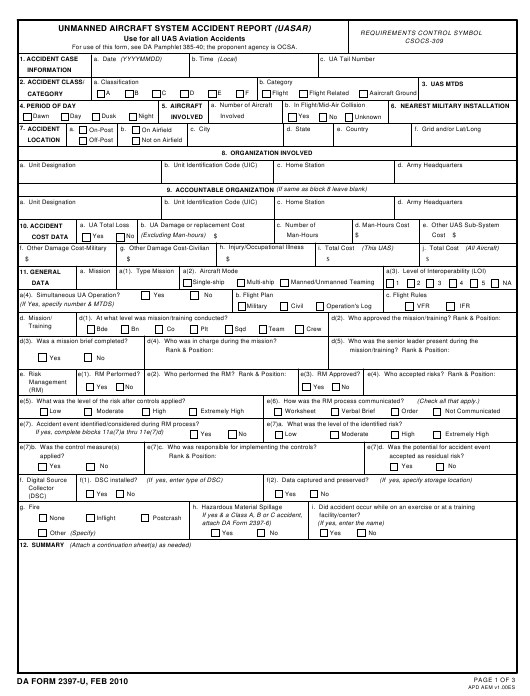 The form - often mistakenly referred to as the DD form 2397-u - was last revised on February 1, 2010. Download an up-to-date fillable PDF version of the DA 2397-u down below or look it up on the Army Publishing Directorate website. d(1). At what level was mission/training conducted? d(3). Was a mission brief completed? d(4). Who was in charge during the mission? e(5). What was the level of the risk after controls applied? e(6). How was the RM process communicated? e(7). Accident event identified/considered during RM process? e(7)a. What was the level of the identified risk? e(7)c. Who was responsible for implementing the controls? f(2). Data captured and preserved? a. Human Factors (Check box D, S, U or N.